Welcome to the New Castle Henry County Chamber of Commerce Website. Henry County, Indiana is an outstanding place to live, work, and grow a business. Whether you’re visiting to find local buainess information, looking for a new place to call home, or you are looking to relocate a business, you will find that Henry County is a quaint little county with a big heart and plenty of opportunities. 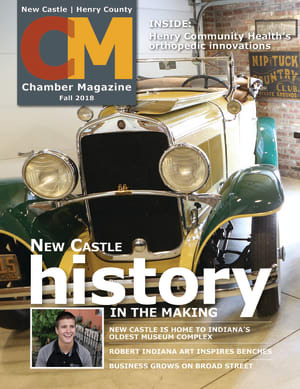 Our rich history dates back to 1822, and the Chamber was established in 1936 to advocate for and support the prosperity of New Castle, Henry County and area businesses. It is an exciting time to be a member of the New Castle Henry County Chamber of Commerce. We are always creating new networking and promotional opportunities to help our member businesses succeed and grow, including space to advertise on the Chamber website, business referrals, monthly networking opportunities, and continuing education. Other great events that allow our member businesses to gain visibility include the Business Expo & Taste of Henry County, Annual Golf Outing, Downtown Christmas Walk, and the Memorial Day Ceremony, Parade, and Festival. You can find more information about these great events on our calendar below. We continue to partner with local government and other organizations to pursue improvements in the overall quality of life for the city, county, and region, particularly in the areas of education, tourism, economic development, community development, and workforce development. Our success in achieving our mission and purpose is due to a collaborative effort from the Chamber Board of Directors, Chamber Ambassadors, City of New Castle, Henry County Council and Commissioners, Chamber members, and area professionals. Our online business directory is another service the NCHC Chamber of Commerce provides to the local community. By supporting the businesses in our directory, you are reinvesting in your community. Check them out at the "Business Directory" tab above. The New Castle Henry County Chamber is the leading catalyst for creating a cooperative, productive, and prosperous community resulting in all businesses desiring an affiliation with the Chamber. The New Castle Henry County Chamber will be an active voice for chamber membership by promoting growth, development and a favorable economic climate. Integrity - We conduct our activities with competence and integrity with responsibility to our members for efficient and effective use of resources. Respect - We are sensitive in our interaction with business, their employees, and our colleagues, respecting the uniqueness, traditions and values of each person while striving to maintain a positive atmosphere for economic growth in our service area. Ethics – We believe in demonstrating the strength, moral principles, honesty and ethics that warrant the trust of the community. Goal #1: The New Castle Henry County Chamber will foster community involvement to develop an ideal community to live and grow in. Goal #2: The Chamber will strive to provide benefits to our members that have defined and measurable value. Goal #3: We will provide an environment for high school and college graduates to find economic opportunities in Henry County. Goal #4: The Chamber will strengthen and diversify income by increased membership and non-dues revenue generation from mission-specific events. Goal #5: We will strive to increase human capital to successfully complete the defined goals of the Chamber. Goal #6: The Chamber will enhance the ability for businesses to succeed in Henry County.